In any workplace, safety is extremely important. Keeping your employees, visitors, equipment, and products safe is something that requires planning from the ground up, literally. The flooring you choose in a facility can have a major impact on the safety of those who work there. According to research by the “National Floor Safety Institute,” slips and falls occur in all manufacturing and service sectors, and account for 26% of all workers’ compensation costs each year in the United States. Failing to consider the use of safe flooring in a facility can prove costly down the line. In many facilities, a skid resistant floor is an excellent line of defense against common workplace accidents and injuries. Skid resistant flooring provides a durable, high-grip surface for areas where liquids can spill, equipment is frequently moved or carried, or where outside weather can affect footing. Many of Cornerstone’s seamless flooring systems and coatings feature varying levels of skid resistance. Oftentimes the flooring surface can be altered to enhance the level of skid resistance even more to meet the specific needs of a facility. In some systems, anything from a smooth “orange peel” texture up to a very rough sandpaper-like texture can be achieved. 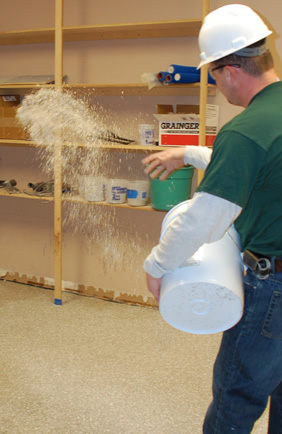 Cornerstone installers do this by spreading, or broadcasting, an aggregate material such as sand over the flooring. The aggregate first cures in the epoxy. A final topcoat is then applied over the newly textured surface. This coating is laid on thick or thin enough to achieve the desired skid resistant texture, and will also seal the aggregate in place and offer further protection to the flooring. All Cornerstone Flooring resinous systems and coatings that feature skid resistance have been tested with industry-accepted methods. These tests use special machinery to verify the skid resistance of a flooring surface, and express that resistance as a Coefficient of Friction. This chart breaks down all of Cornerstone’s seamless flooring products along with their verified coefficient of friction and testing method used (these measurements and other testing measurements can be found on the individual Technical Data Sheets for all of our systems and coatings). There are certain benchmark coefficient of friction values used for all floorings and coatings, regardless of building type, to determine what is considered skid resistant or safe. OSHA considers a walking surface “nonhazardous” when it has a CoF of 0.5 or greater. The ADA recommends a minimum CoF of 0.6 for a walkway to be “nonhazardous.” It is important to note that neither of these values are requirements, but merely widely accepted benchmark recommendations. All of Cornerstone Flooring’s skid resistant floorings and coatings meet or exceed these recommendations. Several of our products feature optional aggregate types and textures to increase the coefficient of friction to more than 1.0, a surface considered highly aggressive in texture and skid resistance. Which Cornerstone Flooring Option is Right for Your Facility? Are extremely heavy objects being moved across the floor? Will there be contact with chemicals or other spilled liquids? Cornerstone Flooring sales representatives are skilled at working with you to determine which of our flooring options is the best fit for your facility. They will take walkthroughs of your facility, discuss any special needs, and make recommendations specific to your project. To speak with a Cornerstone Flooring sales representative near you and to discuss our skid resistant urethane flooring options in more detail, contact us today!